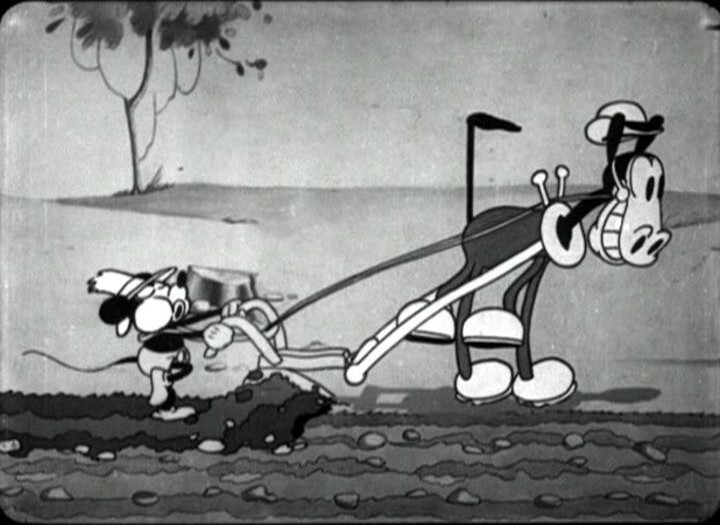 In this weak cartoon (Mickey’s seventh) Mickey and Minnie are farmers. The most remarkable thing about this cartoon is that it marks the debut of Horace Horsecollar. One might say, it marks the debut of Clarabelle Cow, as well, but the early Mickey Mouse cartoons contain a little too many non-distinct cows to state that clearly, because this cow is not different from the others. This cartoon is particularly important in the development of Minnie: she now has lost the bra-like circles on her body and she’s singing for the first time. Notice how the animation of the tongue is completely convincing. Although Minnie’s only singing “lalalala” (something she would do in many cartoons to follow), this is an important step in the animation of speech. This was something I guess Disney was eager to master. Indeed, in the next cartoon, ‘The Karnival Kid‘, there’s suddenly a lot of talking and singing. ‘The Plow Boy’ contains a scene where the background moves the wrong way making the cow walk backwards.